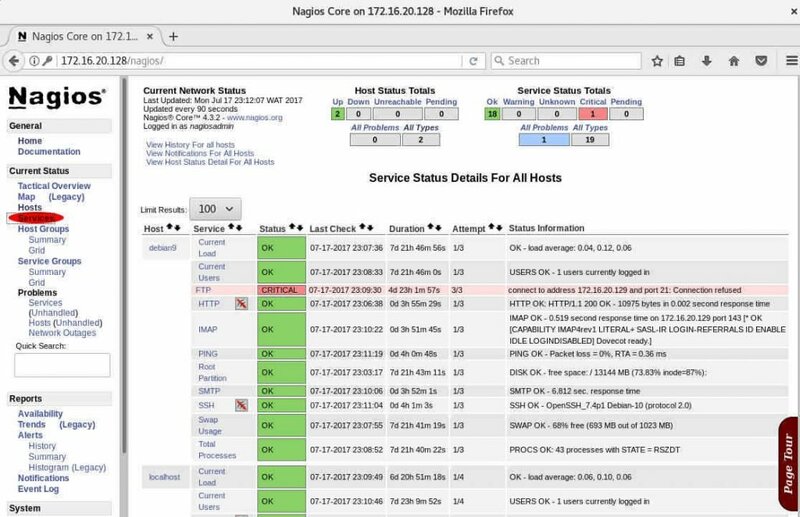 In our recent article we have shown how to install nagios core on Debian 9 to monitor some remote hosts's services. To do that you will need to install Nagios NRPE daemon and plugins on the remote hosts. It is a package that will be installed on all the remote hosts which need to be monitored. NRPE (Nagios Remote Plugin Executor) is an addon which allows you to remotely execute Nagios plugins on remote Linux machines. It allows you to monitor remote machine metrics (disk usage, CPU load, etc.). It can also communicate with some Windows agent addons like NSClient++, so you can execute scripts and check metrics on remote Windows hosts as well. 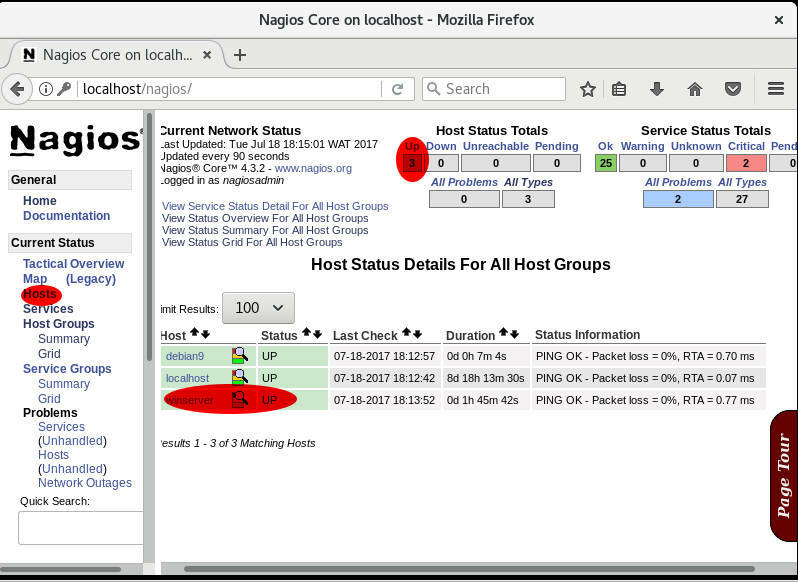 In this article, I will explain to you how you can monitor your Linux and Windows hosts servers with Nagios. a daemon that runs on the remote server, processes requests from the client, and returns status information. The results from the service check are passed from the NRPE daemon back to the check_nrpe plugin, which then returns the check results to the Nagios process. 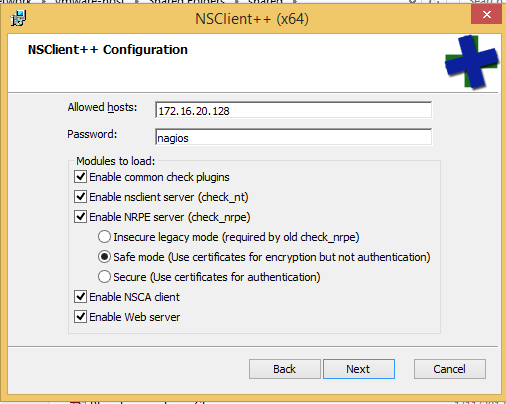 NRPE can be configured to only accept connections from a specific IP address. You can just tell it what commands to run through the connection. Only commands that the local host has configured will be allowed and you can determine if arguments will be sent by Nagios. In order to use the NRPE add-on, you'll need to perform some tasks on both the Nagios server and the remote Linux host where the NRPE daemon is installed on. In our, case the remote Linux host is a Debian 9 server. 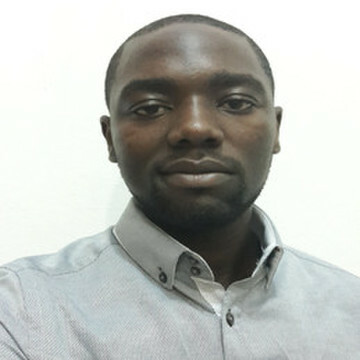 I will show the specifics points of the procedure for Centos and Ubuntu servers. We need to install the nagios and NRPE plugins on the remote server to monitor. Now we can download the lastest version of nrpe which is nrpe plugin 3.2.0 when I am writing this article. Make sure to answer yes to save existing rules. Normally you can use iptables-save command to save iptables new rules. After installing nrpe plugin, we need to configure all the host allowed to communicate with the nrpe plugin on the Linux host. It means that we shall indicate the nagios server information (IP address, etc) to be reached. The file /usr/local/nagios/etc/nrpe.cfg is the one which contains all nrpe settings. Find the directive dont_blame_nrpe to determine whether or not the NRPE daemon will allow clients to specify arguments to commands that are executed. # netstat -at | egrep "nrpe|5666"
You should have the output above which indicates that nrpe plugin works perfectly on the Linux host. The NRPE configuration file that got installed contains several commands definitions which we can be used to monitor our remote host. This article assumes that you have already installed and configured the Nagios server on Debian 9. It means that you will now configure it to detect and add our remote Linux host. If you have not configured it yet, please follow this article. On the nagios server, we will need to install nrpe plugin too and create a configuration file for the Linux host. We will also configure the firewall to allow the nrpe communication with all the hosts. Now we will use a command definition to try to monitor a service (check cpu load) on the remote Linux. You can see that we have a response of the remote Linux to monitor. It shows that our plugin works perfectly on the remote host and the communication is good. Nagios contains by default some object definitions into the /usr/local/nagios/etc/objects directory on the nagios server which represents each type of host that you can need to monitor. We will first create a folder in which we will save all the remote host configuration files that Nagios server must monitor. Nagios has a template file templates.cfg which contains some examples object definitions templates that are referred by other hosts, services, etc. These definitions will be helpful when we will create each remote host file definition. By default, Nagios monitor the server where it is installed through the localhost.cfg file. We will use this file to create the configuration file for our Linux host. Now we will edit our file in order to add our host. # < 10% free space on partition. Your file should look like something above. This output has been truncated. You will have more services definitions. The directive address should contain the address of the remote host to monitor. The directive host_name must contain the name which will appear on your nagios dashboard and it should be indicative for you, so remove the default localhost value and replace it with another name (debian9 is the name in my case). You should replace that directive every where it appears in the file, it means for host and all service definitions. The service definitions present in the file are standard. I will give you below three service definitions to add at the end of the file for imap, ftp and smtp if you need to monitor these services on your remote Linux. You can notice that I have added the directive cfg_dir=/usr/local/nagios/etc/objects/servers which indicates the new host's directory to consider. You can notice that the directive cfg_file indicates the different services and hosts configuration files used by nagios. It means that if we didn't create a directory but simply the file linux.cfg in the default /usr/local/nagios/etc/objects directory, we should simply need to add the directive cfg_file=/usr/local/nagios/etc/objects/linux.cfg so that nagios would detect the configuration of our remote host. I was accessing on my remote Linux this is why you can see that I have indicated the IP of my Nagios server. You can see that we have our new remote Linux with its services. We have not installed FTP service on our remote host yet. This is why this service is in a critical state. Indicate the nagios server IP and the nagios password for web access. Also stick all "Enable" options (check plugins, check_nt, check_nrpe, web server, nsca client) and safe mode. You can install with leaving the password blank. You don't need to indicate it. Now that it is installed, we shall verify if NSClient service is started by opening services.msc. Now search about nsclient and verify its state (must be Running). Check that the startup type is set to "Automatic"
We can see that our plugin is working. Now we can configure our nagios server side. 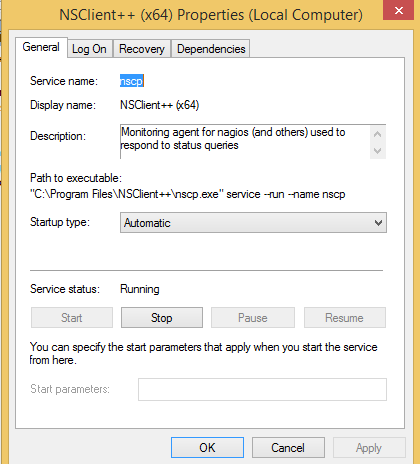 On Nagios server, we need to define our new windows host to monitor with its services. We shall add a new host definition for the Windows machine that we are going to monitor by modifying the /usr/local/nagios/etc/objects/windows.cfg file. As for our Linux host, we will copy the windows configuration file in the servers directory that we have created earlier. Normally we are already into the /usr/local/nagios/etc/objects/servers/ directory on the server. So we will edit the windows host file. Try to have something as the output above. This output has been truncated. The IP address must be your Windows IP address. You can use another host_name value. 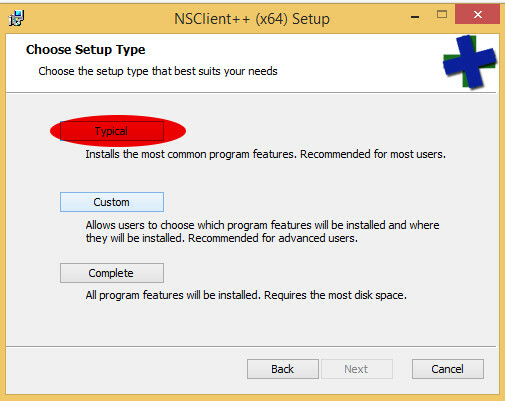 In the windows host file by default, it doesn't have a service definition to check the ping so you can add the service below at the end of the file. 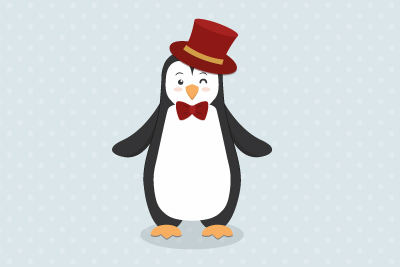 It is the default check_ping service present in Linux host file. We will need to change the definition of the check_nt command to include the keyword "-s <PASSWORD>" argument where <PASSWORD> is the nagios password that you have specified on the Windows host (nagios in our case) during the NSClient++ installation. At this time, you should not need to indicate the password in the command.cfg file, you could skip this step. Now can open the nagios dashboard page to see our new host with its processes. You can see that we have our windows host added. 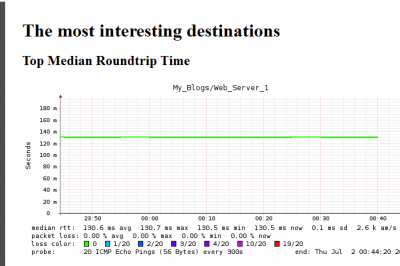 If you look the services, you can see the check_ping that we have added. We have not launched explorer this is why you can see the critical message about it. Now you have two new servers added on your nagios dashboard. 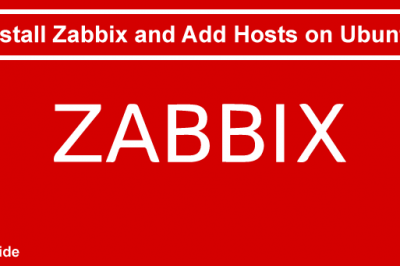 We have seen how to add Linux and Windows hosts on Nagios server implemented on Debian 9. We have described how to install and configure NRPE which is responsible for the monitoring role. It is used to monitor Linux and Windows machines with Nagios. 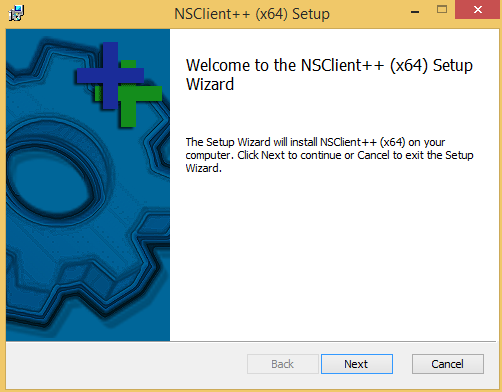 On Windows hosts, you will need to install NSClient++. Your tutorial worked great for me. Very well laid out and easy copy/paste. Thanks. happy to know that the tutorial helps you.